Easy DSC and Installation! The GX1700 makes DSC easy. With an internal 12 Channel GPS built into the front panel, there is no need to hassle with wiring the radio to a GPS for DSC. Out of the box and ready to go, DSC calling, position sharing, waypoint navigation, navigation to DSC distress calls can all be performed with just a few simple steps. GPS Compass - Navigate to Waypoints The GX1700 is capable of entering and saving up to 100 waypoints. These waypoints may be selected and navigated to by using a unique navigation compass display that shows your vessels SOG, COG, BRG (Bearing) and DST (Distance) to the waypoint with the internal 12 channel WAAS GPS. 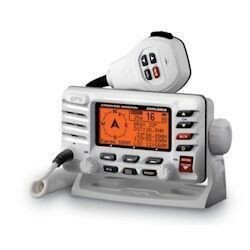 ITU-R M493-11 Class D Digital Selective Calling The GX1700 is an ITU-R M493 Class D class VHF with a separate Channel 70 receiver, which allows DSC calls to be received even when listening to communications. RAM3 second station mic capable Need to remotely control the VHF from your cockpit of fly bridge? 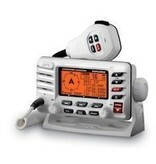 The GX1700 is RAM3 remote mic capable to control all VHF, DSC functions at a second station. Big, bold display There is no question about it. With a big, bold display there is no mistaking the information. The contrast and brightness can be adjusted for situations where the radio cannot be mounted directly in front of you. DSC Position Polling and NMEA in/output Easily share position information with other DSC equipped vessels using the position request and position reporting functions. With the push of a few buttons you can request the position of another vessel, or simply send your position information to the vessel you select. Programmable Scan, Priority Scan and Dual Watch Scanning is not an issue with the GX1700 The radio can be setup to scan any number of channels with or without a Channel 16 as the priority channel or simply can be setup to scan between a priority channel and one other channel (dual watch). Clearvoice noise reduction technology The GX1700 features Clear Voice Noise Reduction Technology eliminating unwanted background noises like engines and wind during transmission. This assures transmissions are crystal clear along with dedicated 16/9, H/L keys and channel selection. Programmable Channel Names The GX1700 is supplied from the factory preloaded with description of the use of Marine channels (16-Distress, 22A-USCG, 71-Pleasure...). The channel names may be customized to easily understand the use of each channel. NOAA Weather channels and Weather Alert 10 NOAA and Canadian Weather channels are pre-programmed and easily selectable using the dedicated WX key. In addition, the GX1700 can be set to monitor WX channels and provide an audible alert to inform of pending storm advisories. 3-Year waterproof warranty If the GX1700 fails for any reason (including water damage) during normal use for the first 3 years of ownership, STANDARD HORIZON will repair or replace it free, without hassles or charges. If it fails for anytime thereafter in normal use, for as long as the original purchaser owns the radio, STANDARD Horizon's Lifetime Flat Rate and Customer Loyalty Service Programs will cover it.